Kacie Hultgren is teaching our Design for Desktop 3-D Printing Training Camp. In the 3-D printing universe, she is better known as PrettySmallThings. Kacie is a scenic designer in the theatre industry, and was recently profiled in Stage Directions and Wired for her work using her 3D Printer to create scale set models. Her delicate designs are Thingiverse favorites. 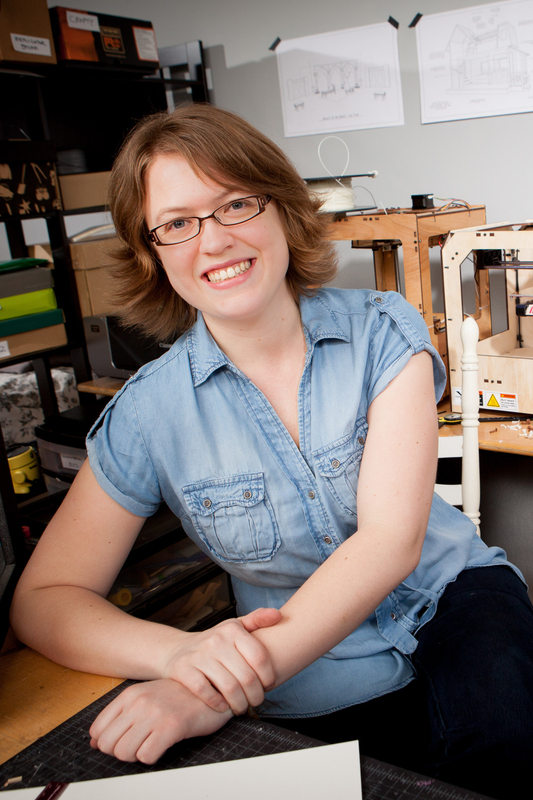 She is an expert AutoCAD user, and brings enthusiasm for craft & design to 3D printing. 1) I’m proud of my archive of shared 3D designs. When I started 3D printing, I had no intention of sharing my work. But, I shared one design on a whim, and got hooked. Looking through the individual designs, I can see old struggles, new skills, and waves of ideas. The numbers of downloads and views, is astounding to me. 1) Storing things too long. I’ve moved quite a bit in the last decade, and every time I put things into a storage unit, I regret it when I have to pull it back out. Recently, I’ve been experiencing this more in terms of ideas, and hard drive space. I’m still working on a solution to deal with possessions, files and ideas in an immediate way – if I don’t have the time, space or effort to to utilize it soon, how do I gift it, recycle it or release it? 2) I’m not sure I’ve learned from it yet, but a persistent challenge is taking on too many projects. I continue to look for ways to set aside time for long-ranging plans and ideas, so that the more urgent, short term projects don’t consume my time. 1) Alternative thermoplastics. Not every problem can be solved with utility and beauty in ABS & PLA. I think desktop 3D-printed products will really take off when there are a greater variety of materials available. Between Taulman nylon, and lay wood, and a number of other materials hitting the market recently, there’s some amazing innovation going one and I can’t wait to see where it’s headed. 2) Free CAD tools – Sketchup was one of the first, but it’s not the last. There are so many awesome, free tools available for creating designs in 3D. I’m interested to see what the world is like when 3D modeling skills are as pervasive as word processing skills. 3) Kickstarter, and crowd funding in general. I think the combo platter of getting capital in the hands of people with big ideas, and testing the market waters before launching a product, is an amazing innovation. 1) #11 Exacto Knife. I use these for model building and go through literally hundreds of blades a year. 2) Macbook Air – Under a pound, fits in a purse – couldn’t ask for a better daily companion. 3) My 3D Printers – At first they were a luxury, but these days they feel like a necessity. Since I purchased my first, my workflow has changed so much I would have a tough time reverting back. 4) Black Pens. A Pencil will do in a pinch, but erasers aren’t allowed. It’s better to cross something out, and leave evidence of an idea, than erase one. 1) The Designers of Thingiverse.com – Thingiverse continues to be the first stop in my design process. Whenever I’m chasing a new idea, I always stop to draw on the knowledge of what’s out there. There are so many ideas, solutions, and questions that I always walk away with some needed perspective. 2) New York City – The hubbub of the city can be draining, but being surrounded with so much opportunity, and so many people striving for the next best thing, is really inspiring. 3) My boss/colleague/mentor, John Lee Beatty. He can rally a group of people behind an idea and project like no other. He also reminds me to take my nose out of my computer on occasion – sometimes a pencil and paper are the simplest way to communicate an idea. 4) The culture of making in the theater industry. In other industries, making seems to be defined as a specific role. Engineers build things, programmers program etc. But in the theater industry, it’s just assumed that you know how to build things with your hands. It makes it incredibly easy to work with other people.